On Monday we had family visiting from out of town and I baked a cake. This cake has been a family favorite since I found the recipe in a 1971 Grange Cookbook. A Cake for Exhausted Cooks. Simple ingredients and the cake is done in a hour from start to finish. fresh lemon juice squeezed from my mother's lemon tree. Water and oil. Fresh eggs from our chickens and a package of lemon jell-0. A cake that is moist and has a delicious flavor. 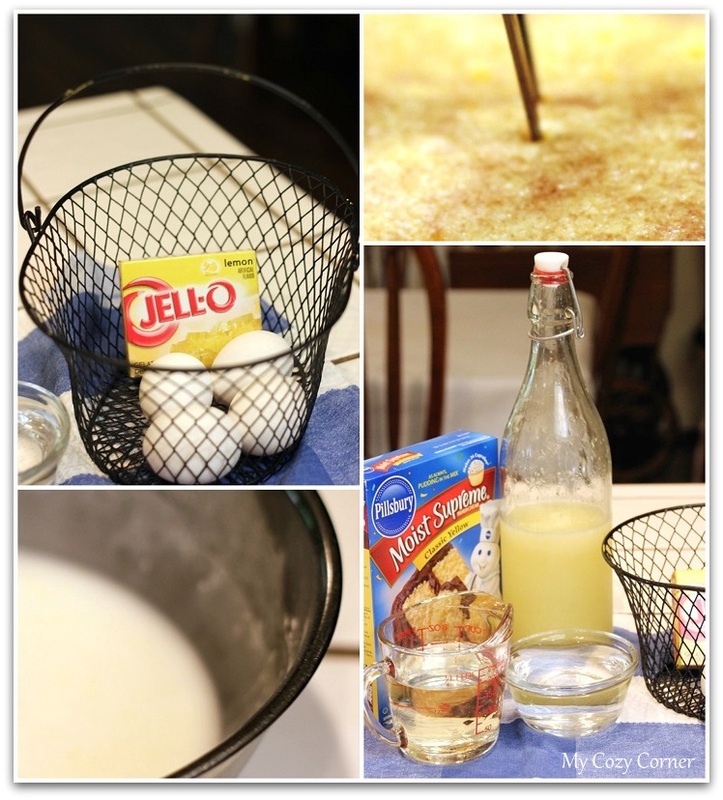 Poking the holes in the cake is easy and adding the lemon glaze is the best! Bake in greased and floured oblong pan 13x91/2x2 at 350 degrees F. for about 35 minutes. 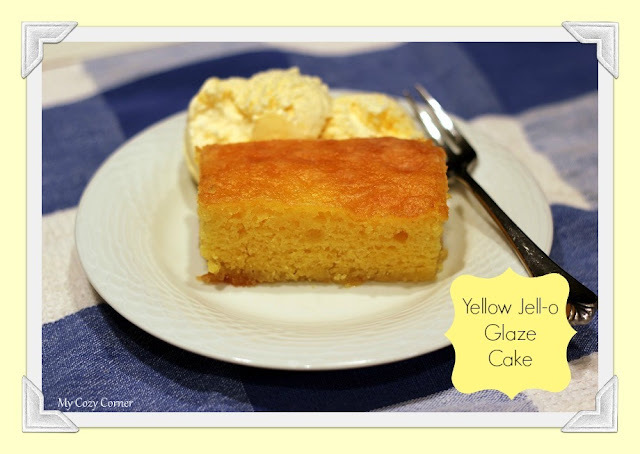 Yellow Jell-o Glaze Cake tastes so delicious with Triple French Vanilla Ice Cream. I hope you try this wonderful and easy cake for family and friends. You won me just by the name. I am pinning this and making it soon. I am not the best baker so I appreciate a simple delicious cake. Thanks for sharing it with us on foodie friday. This cake looks so moist and delicious and I can't wait to taste it. Thank you so much for sharing with Full Plate Thursday and have a great week! Thanks for sharing at Home Sweet Home. Looks delicious. My grandmother gave me this recipe years ago. It is a family favorite. We make it in a tube cake or Bundt pan though. It presents beautifully, I'll have to try it in an oblong pan.